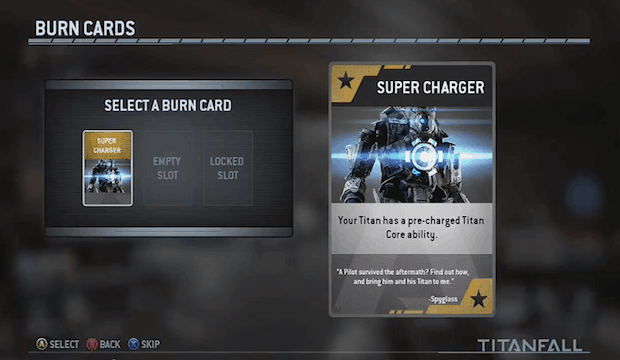 Titanfall will have a new perk-like feature called Burn Cards; these are similar to perks in other FPS games, but you can only use them once, and once you die, they’re gone. When you have a Burn Card equipped, you get additional XP per kills and it appears in your HUD red. The burn cards range from passive stat buffs (faster movement) to a new secondary weapon. So, the way they work is you equip yourself a free Burn Card at the beginning of the match, or in a lobby. When you get into a match, you can use up to three throughout the course of match. Every time you use one (you use one at a time), until you die, the effects of that card remain working. So, try to stay alive. If it’s a round-based situation like Last Titan Standing, the Burn Card continues on round after round, etc. until you die or the match ends. It’s a great way to sort of let people be extra powerful for a short period of time without totally unbalancing the game.